Hundreds of Pushkas (Tzeddakah boxes) have been distributed to Jewish homes round the world, where charity is given by Jews regularly, whether before Praying, before an important meeting or business deal or in a time of crisis to merit a salvation or even a miracle. It is also a custom to donate at a time of a personal Simcha (e.g. wedding, bris etc.) as an appreciation to Hashem's kindness and as a prayer that all should go smoothly. There is a special custom to give charity to the Rabbi Meir Baal Haness Pushka before Lighting the Shabbat Candles, which is a special time for prayer specificly for good and healthy children and Yiddishe Nachas. 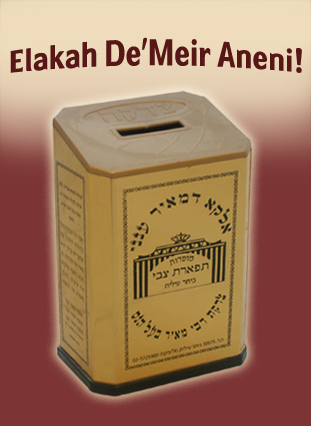 In addition to donating Tzeddaka in his memory, it is the custom to say the words "Elakah De'Meir Aneni" – "G-d of Meir answer me!". "אמר רבי בנימין הכל בחזקת סומין עד שהקדוש ברוך הוא מאיר את עיניהם, מן הכא ויקפח אלוקים את עיניה, ותלך ותמלא החמת. אלקא דמאיר ענני, אלקא דמאיר ענני, אלקא דמאיר ענני. בזכות הצדקה שאני נודב לעילוי נשמת רבי מאיר בעל הנס זכותו יגן עלינו למצוא את האבדה שאבדתי". Who was Rabbi Meir Baal Haness? Rabbi Meir Baal Haness was one of the greatest of the Tannaim (Sages of the Mishna). The phrase ‘Baal Haness’ means "the master of miracles” due to the wondrous miracles that G-d has performed and continues to perform in his merit. Already during his life time Rabbi Meir perfomed miracles by saying the phrase "Elaka De'Meir Aneni" – "G-d of Meir answer me!". As brought down in the Gemarah (Talmud) Avodo Zarah 18: that Rabbi Meir told a Roman Guard when in a situation of danger to say the words "Elaka De'Meir Aneni" – "G-d of Meir answer me".The guard asked, “How can I be guaranteed that this will save me?” R' Meir replied, “Look ahead, There are man-eating dogs over there. I will go over to them and you will see for yourself.” R' Meir walked towards the dogs. They ran over to tear him apart. He cried out “G-d of Meir answer me!” and the dogs retreated. When the guard was ordered to death by hanging and the rope was tightened round his neck he cried out "G-d of Meir answer me", the rope snapped and the guard was saved from death. Rabbi Meir Baal Haness passed away on the 14th of Iyar. He is buried close the city of Tiberius. The grave of Rabbi Meir Baal Haness is one of the holiest sites in the Jewish world and thousands of people flock there to pray for their salvation. Leading Rabbis through out Jewish history greatly endorsed donating Charity to poor and needy families in Israel in Memory of Rabbi Meir Baal Haness. It is legacy to all generations that he will personally intercede in Heaven, on behalf of anyone in distress, who will give charity to the poor in Israel in his memory. To date many people have merited miracles and salvation when contributing to Mosdos Tiferes Zvi in memory of Rabbi Meir Baal Haness, whether by a direct donation or via the Pushka.